It all started on board an Alaska Railway train between Anchorage and the Denali National Park. I recorded a few minutes on the Wilderness Express platform at the rear of the train, with the rhythm of the wheels hitting the rails and the recurring sound of the horn echoing against the wild mountains. This was in late June, when the snow had all melted and the thin pine trees would not damper the sound. It is one of the last places where modern human civilisation has never had any visible impact, aside from the train and a few gold mines. What's more, humans have been living on these lands for at least five thousand years in harmony with nature. This song is really to capture the essence of the moment and the idea of human presence in nature, facing life in its broadest sense. 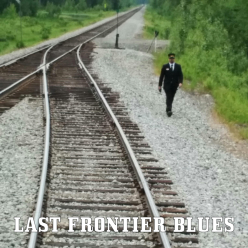 The blues influence comes from the North American relatively recent history where this music was formed but also from its ancients roots stretching back into several continents. It also carries the deep feeling of despair and unfairness caused by the contrast with other parts of the world where the very same life is beeing so greatly diminished by excessive human behaviour. Blues is also related to slavery, which has receded thanks to the fundamental principles of dignity and freedom between humans. We must continue today and extend even further by giving dignity and freedom back to nature in this world where we are only one life form among many. Thanks Adeline for the photo.